The Journal of Clinical Chiropractic Pediatrics (JCCP) is the official peer-reviewed journal of the ICA Council on Chiropractic Pediatrics. It is committed to publishing research, scientific and professional papers, literature reviews, case reports and clinical commentaries for chiropractors and other health care professionals interested in the treatment of the pregnant, postpartum and pediatric patient. 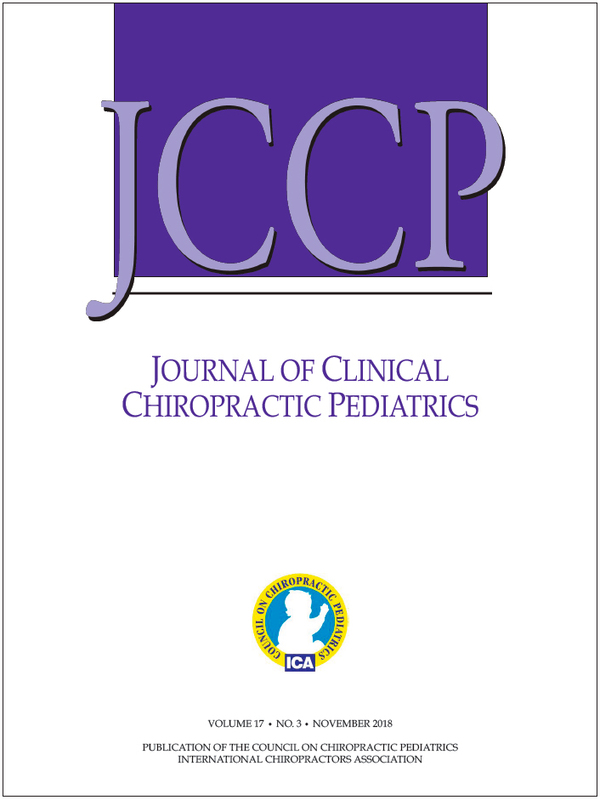 Through the publication of these papers and the dissemination of this information, the JCCP seeks to encourage professional dialogue and awareness about chiropractic pediatric care to help enhance patient care and improve patient outcomes. Editors: Sharon A. Vallone, DC, DICCP, FICCP, Cheryl Hawk, DC, PhD. We are hopeful that this venue will provide field clinicians interested in maternal health and pediatric chiropractic with current research, case reports and clinical commentary that they will find both useful and informative. We invite you to submit your own research or scientific writing for consideration for publication in this journal. Time passes unnoticed as we do what we love to do in our offices on a daily basis. Working with children and their families fuels the passion we have as chiropractors to serve their health care needs with a safe and effective alternative to the barrage of chemical and surgical interventions that are too readily offered to treat symptoms without first exploring and correcting the root of the problem. The foundation of health rests on the triad of chemical, structural and spiritual/emotional balance and although these interventions may save lives in emergent situations, any long-term improvements in health must address all of these. Introduction: This case report describes the effects of chiropractic care on a three-year-old girl who was previously diagnosed with autism spectrum disorder (ASD) experiencing significant language delays as well as delays in other aspects of development including sociability, cognitive awareness, and behavior. The patient was followed for a period of seven months. Presenting Concerns: A three-year-old girl diagnosed with ASD was brought into the chiropractic office by her mother for a trial of chiropractic care. The patient was non-verbal, walked on her toes and was often “off-balance” when walking. Temper tantrums often ensued when the patient was touched by someone. The patient’s mother was hoping for a general reduction of ASD symptoms. Interventions: Chiropractic care commenced and initial treatment plan was to see the patient for 12 visits over a six-week period. The examination had to be tailored to the patient based on her ability and willingness to comply with instructions. Spinal manipulations, also called chiropractic adjustments, were performed using a spring-loaded instrument. Outcomes: The patient’s mother reported improvements in all areas of development over the course of the treatment. Improvements were documented in cognitive awareness, sociability, and behavior, as measured objectively by the Autism Treatment Evaluation Checklist (ATEC), which the patient’s mother completed before treatment and after the initial six weeks. Before starting treatment, the ATEC composite score was 105; after six weeks of care the composite score dropped to 63. The patient’s mother, who was satisfied with the outcomes, chose to continue treatment and completed the ATEC monthly. After seven months of care, the ATEC composite score was a 32. Conclusion: This case report helps to strengthen the relationship between correcting subluxations and the improvements in the myriad of symptoms of children diagnosed with ASD. Introduction: Constipation is a frequent childhood complaint. 90% to 95% of the time it is characterized as a functional type. Chiropractic is a natural alternative frequently chosen for children with constipation. The purpose of this case report is to evaluate the safety and efficacy of the chiropractic adjustment vs the use of laxatives in the treatment of functional constipation. Case report: A 21- month female infant presented at the clinic with chronic constipation for the past 15 months. She had been on laxatives for the last 14 months. After the first chiropractic adjustment, the bowel movement improved to once every day or second day. Methods: The search was done on Medline via Ovid and on Pubmed. Discussion: The evidence point to the conclusion that laxatives are insufficiently tested for childhood constipation for safety, efficacy and side effects. The majority of patients treated in chiropractic showed improvement immediately after the first visit. Conclusion: Chiropractic experience-based practice showed positive results in functional constipation. Children and infants with constipation as with other conditions should be treated regarding all aspects of their health. Introduction: Nocturnal enuresis is a common pediatric condition with low scientific value in literature. Nocturnal enuresis is a frequent complaint of patients who present to chiropractic clinics. Early management can often avoid the development of socially disruptive and stressful conditions in the future. The purpose of this study is the resolution of nocturnal enuresis in a 10-year-old female patient after receiving chiropractic care. Design architecture: Case report. Methods: Databases searched were PubMed, Mantis, Cochrane, Index to Chiropractic Literature, CINAHL and google scholar. Keywords were nocturnal enuresis, bedwetting, chiropractic, child and conservative management. Presenting concerns: A 10-year-old female child presented to the chiropractor’s office alleging constant night-time bedwetting. This condition affected the self-esteem of the patient. Behavioral and medical approaches were unsuccessful. Interventions: The outcome measures assessed were the amount of urination (little, moderate or full diapers) against dry nights and the patient’s overall sense of well-being rated on a global well-being scale. The patient completed the initial questionnaire and responded to the diagnostic criteria for nocturnal enuresis. A chiropractor performed an exhaustive history and spinal examination. The patient was treated on 14 occasions over 10 weeks. Throughout the 10 weeks, the patient kept a diary to record the number of wet and/or dry nights per week and a global well-being scale was completed at every second week until the end of the treatment plan. Outcomes: Results show a decline in nocturnal enuresis and at the end, complete resolution. Also, there was a positive change in the global well-being scale score of 10/10 by the end of the treatment plan. Conclusion: It appears that chiropractic treatment may have a role in the improvement of nocturnal enuresis. Keywords: nocturnal enuresis, bedwetting, chiropractic, child and conservative management. Introduction: The aim of this study is to help chiropractors and other healthcare professionals recognize the signs and symptoms that can lead to the identification of a malignant condition like an osteosarcoma, especially in cases where atypical pain presents in pediatric patients. Clinical features: A 13-year-old boy presented with severe knee pain resulting in the inability to bear weight. There were no obvious causes for the pain that had first developed 24 hours prior to the patient’s visit to the chiropractor. Treatment primarily consisted of administering an x-ray that lead to the discovery of a malignant tumor on the right proximal tibia. Interventions and outcomes: The patient was sent to a pediatric hospital for further investigation which resulted in a diagnosis of primary metastatic osteosarcoma. Treatment consisted of total resection of the tumor, prosthetic reconstruction, and chemotherapy to eradicate the cancer. The patient is not yet in remission; however, there is no visible trace of malignancy. Conclusion: Pediatric malignant tumors are typically very aggressive; therefore, early detection of clinical presentations and timely intervention are crucial to improve the outcomes in pediatric patients with primary metastatic osteosarcoma. This particular patient was seen at the right time and a later diagnosis would have likely impacted his prognosis. This case report provides a good example of when to refer a patient. Articular manipulation in this case would have harmed the patient. Does breastfeeding lower the risk for childhood obesity: what is the evidence? Background: Investigate the evidence to determine what the association is between exclusive breastfeeding and childhood obesity. Method: Systematic reviews, meta-analysis and cohort studies were used to determine the impact of breastfeeding on childhood obesity. Results: Five studies consisting of the highest quality research possible; two systematic reviews and meta-analysis, one systematic review and a cohort study. A total number of 110 papers were included in the analysis of the above. Twenty of the 110 papers focused specifically on exclusive breastfeeding and childhood obesity, but valuable information was obtained from the other papers. Conclusion: Research suggests that early breastfeeding especially of longer duration, helps to protect against childhood obesity. Higher quality studies must be undertaken to determine whether this association is absolute or confused by confounding factors. Am Fam Physician, 2010;81(6):745-748, 750. Pilz S1, Trummer C2, Pandis M2, Schwetz V2, Aberer F2, Grübler M2,3, Verheyen N4, Tomaschitz A5,6, März W6,7,8. Improving Vitamin D Administration to Breastfeeding Newborns Using a Quality Improvement Model. Twenty-Year Trends in Diagnosed Attention-Deficit/Hyperactivity Disorder Among US Children and Adolescents, 1997-2016. Gestalt Breastfeeding: Helping Mothers and Infants Optimize Positional Stability and Intraoral Breast Tissue Volume for Effective, Pain-Free Milk Transfer. Interventions to Improve Breastfeeding Self-Efficacy and Resultant Breastfeeding Rates: A Systematic Review and Meta-Analysis. Efficacy of an Osteopathic Treatment Coupled With Lactation Consultations for Infants’ Biomechanical Sucking Difficulties A Randomized Controlled Trial. JAMA Intern Med. Published online August 20, 2018. Obesity as a Predictor of Delayed Lactogenesis II. Human milk oligosaccharides in premature infants: absorption, excretion, and influence on the intestinal microbiota. Underwood MA1, Gaerlan S2, De Leoz ML2, Dimapasoc L2, Kalanetra KM3, Lemay DG4, German JB5, Mills DA3,5, Lebrilla CB2. Pediatr Res. 2015 Dec;78(6):670-7. doi: 10.1038/pr.2015.162. Epub 2015 Aug 31. Intriguing findings regarding the association between asthma and ADHD. Vitamin D in adolescents: Are current recommendations enough? US Emergency Department Visits for Adverse Drug Events From Antibiotics in Children, 2011–2015.